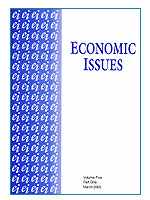 Contributors to Economic Issues should send their articles, in WORD format, via an e-mail attachment to economic-issues@ntu.ac.uk. This helps speed up the editorial process. The article should be accompanied by an abstract of (max.) 200 words, up to five keywords, and three JEL codes. The manuscript should be double line spaced. Can you please place tables, figures and any other matter at the end of the paper, marking their approximate position in the text. Contributors should also submit a separate sheet with their name(s) and full contact details, along with the title of their paper. Any enquiries regarding submissions to Economic Issues can also be sent to the above e-mail address. The journal has a policy of communicating using e-mail, on the grounds that it helps to save costs and that it can provide a faster service. Authors whose manuscripts are accepted for publication will be required to prepare the final copy in electronic form in accordance with the economic issues style guidelines.